WEST BABYLON, December 3, 2018 –Federation of Organizations has been selected to develop one of four sites under Vital Brooklyn’s affordable housing initiative. The announcement of the winning proposals came from New York State Governor Andrew M. Cuomo’s office on November 29. 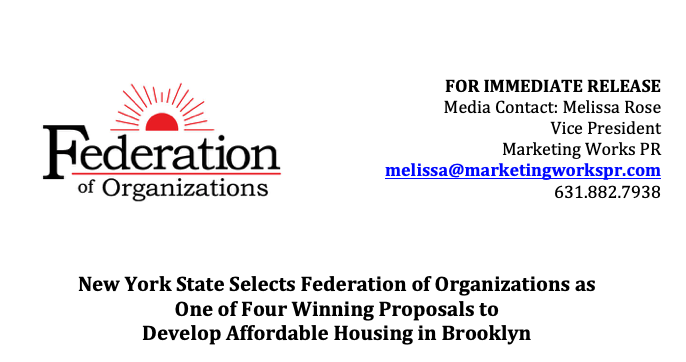 “This is, without a doubt, great news for Federation of Organizations, which will provide quality, affordable homes and supportive services for seniors in central Brooklyn,” said Barbara Faron, CEO, Federation of Organizations. The nonprofit human service agency will create 119 affordable homes on a 21,000-square-foot lot in Brooklyn, across the street from Interfaith Medical Center, known as “Interfaith Herkimer: Site A.” Of the units, 59 will be affordable housing for seniors who meet income requirements, 59 will be supportive units for frail-elderly seniors, and one will house a building superintendent. Federation collaborated with CSD Housing, Urban Architectural Initiatives, and Mega Contracting to develop the proposal and will continue to do so in the development. The site will provide housing for seniors, including a set aside for frail and elderly seniors who will receive on-site supportive services. Space on the ground floor will be used for food assistance programs. Social workers, case managers and nurses will also operate on site. A terrace on the second floor will have seating and offer exercise classes, and another on the seventh floor will feature an urban farm. The building will be constructed to Passive House Standards and will include solar shades and a green roof. All together, the four proposals approved by New York State will create more than 2,700 affordable homes in central Brooklyn. The developments will advance the Vital Brooklyn initiative’s $578 million commitment to build 4,000 units of affordable housing. Federation of Organizations is a large, multi-faceted, not-for-profit human service agency that has been helping people to help themselves for over 45 years. To find out more about these programs, call 631-669-5355 extension 1106, or visit Federation’s website at www.fedoforg.org.